Happy Wednesday to you all! Today is the last day before Easter break for my kids so I’m attempting to cram all my blog work & housework in today (well, and yesterday too). I picked up a lot of SinfulColors polishes awhile back and today I have the first four from the Card-ed Glitter collection: Trump Card, I’m All In, Cash Game, and Aced Out. Trump Card is a really lovely off-white creme polish with gold shimmer. The first coat is uneven, but the second coat is better. This is 2 coats plus top coat. 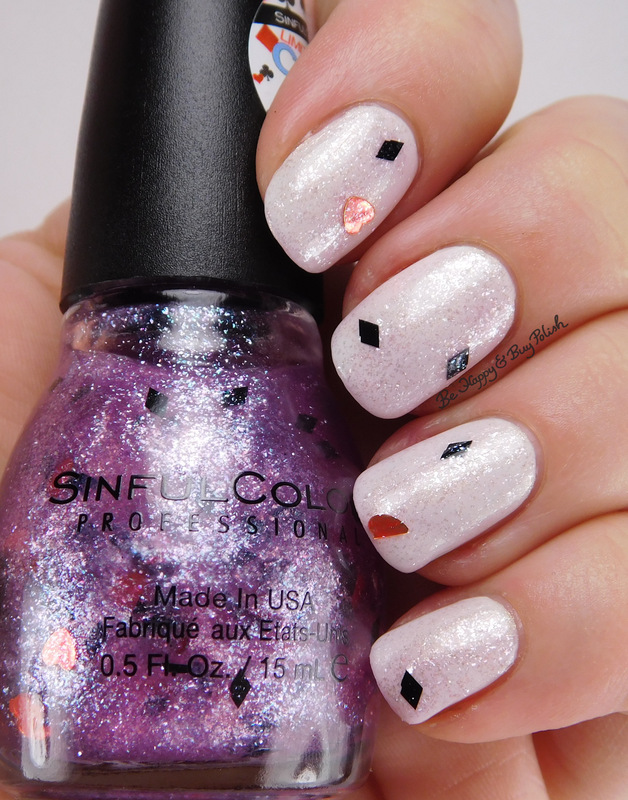 I’m All In is a topper with a very lightly purple tinted shimmer base, with diamond and heart glitters. Surprisingly, the shaped glitters weren’t too hard to get out but it wasn’t like super easy. This is a thick formula and uneven. I used 1 coat over Trump Card plus top coat. Cash Game is a green-tinged yellow polish with yellow shimmer. Pretty sure I used the word hideous when describing this on my snapchat (username bhappybuypolish). BUT, it did have nice coverage and a good formula. This is 2 coats plus top coat. Aced Out is last, it is a grey-green with gold, green, purple shimmer. This is my favorite of the bunch. Formula was just as Cash Game, very nice with good thickness. This is 2 coats plus top coat. I feel kinda bad I was a little harsh with Cash Game but it reminds me of 70s pimp necklaces or something. LOL! Trump Card is a really lovely wedding white and is my second favorite. Well, what do you think of these four? Great swatches of them. Nothing is really catching my eye though other than the last color, Cash Game.